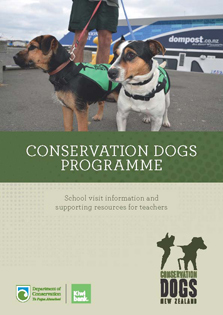 Use this resource to learn about conservation dogs, Predator Free 2050, biosecurity and how to take conservation action in your local community. This resource contains teaching and learning material to support a unit of work grounded in Environmental Education for Sustainability (EEfS)/Conservation education themes. It's based on an integrated, inquiry learning process. Understand the important role conservation dogs play to protect New Zealand’s unique nature. Understand how pests affect the environment and our native species. Identify how to take action to identify and reduce threats to our native species. We would love to get your feedback about our resources so they are useful to you and your students - email conservED@doc.govt.nz and tell us what you think. For questions or feedback about these resources, email conservED@doc.govt.nz. If you can't view these files contact us to request another format. About our files. This programme uses highly trained dogs and their handlers to detect New Zealand’s protected species or unwanted pests.